Create the appropriate exploration (or lens) for the chart. Sometimes looking at a table of data is helpful, and other times it's difficult to take it all in, see the bigger picture, or draw meaningful insights from those rows of numbers. With Analytics charts, you can transform tables of data into beautiful and informative visualizations that won't require your audience to do math in their heads. They'll get the insights quickly, and you'll spend less time explaining. What's not to like? But how do you go from a table of data to a chart? Which chart should you choose? And what's the right data to visualize? Before we can answer these questions, let's first ask: What's the overall goal? We want to create visualizations that are useful and provide insights that your team can act on. Imagine you're a business analyst keeping track of opportunities for your United States based electronics distribution company. Like many people, you've been using a spreadsheet to tabulate opportunities in the current fiscal year and to keep an eye on the product pipeline. You create reports from this spreadsheet, but you often find yourself having to explain the numbers to colleagues and managers. You wish there was an easy way to create eye-catching, informative graphics that can be easily presented and shared. That wish is Analytics's command. First we need to get the spreadsheet data into Analytics. Start by signing up for a special kind of Developer Edition Org that has Analytics enabled. For this project, you can’t use an existing Developer Edition org. You must sign up for a special Developer Edition because it comes with a limited Analytics Cloud Platform license. You’ll be logged in to your Developer Edition org and redirected to the Setup page. Normally you'd export the spreadsheet to a CSV file, then import the file into Analytics as a dataset, but we've already created a CSV file for this project. Download the CSV file and save it to your computer. In your Developer Edition org, open Analytics. Click the app launcher ( ), and then click the Analytics Studio tile. In Analytics Studio, click Create in the upper-right of the screen and choose Dataset. Click CSV as the source of the data. In the new dataset screen, click Select file or drag file here... for CSV files. 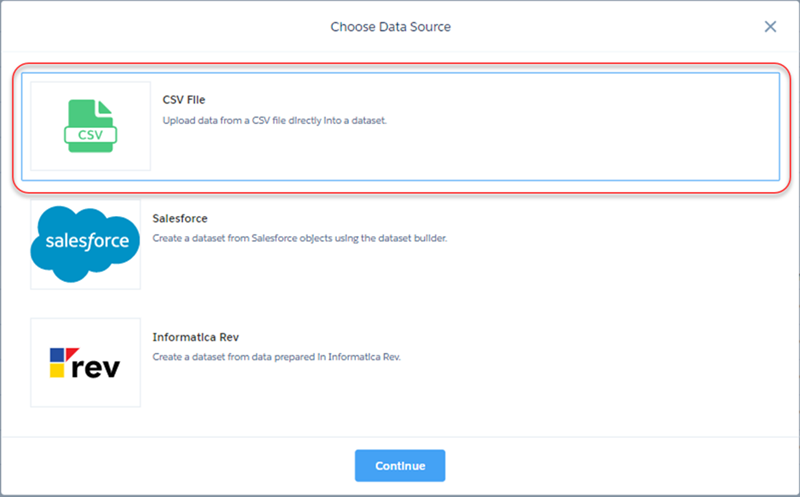 In the file-selection window that opens, select the file CSV file you downloaded and click Open (or the correct button in your operating system to upload the file). The file should be named ProductPipelineUSA.csv. In Dataset Name, name the dataset ProductPipelineUSA and click Next. In Edit Field Attributes, click Upload File. Click Got It! to complete the upload and create the new dataset. Give it several seconds. When the dataset is ready, it will appear in the list of datasets. There are more than a dozen types of Analytics charts available, but not all charts are created equal. Some are just better at visualizing data in a way that pops out the specific insights you're trying to communicate. In Analytics, each chart has certain characteristics that determine the type of data it can display. Hover over the chart type, and the resulting tooltip tells you the number of dimensions (columns with categorical data) and measures (columns with numerical data) required to use the chart. For example, in the image above, the tooltip shows that the Waterfall chart requires 1 measure and at least 1 grouping. But even if two different charts could display the same data based on the information in their tooltips, one might do a better job at conveying the insights you're looking to find and communicate. For example, you could show pipeline stages using a bar chart or a waterfall chart. Notice anything? The bar chart doesn't display the total value of opportunities. 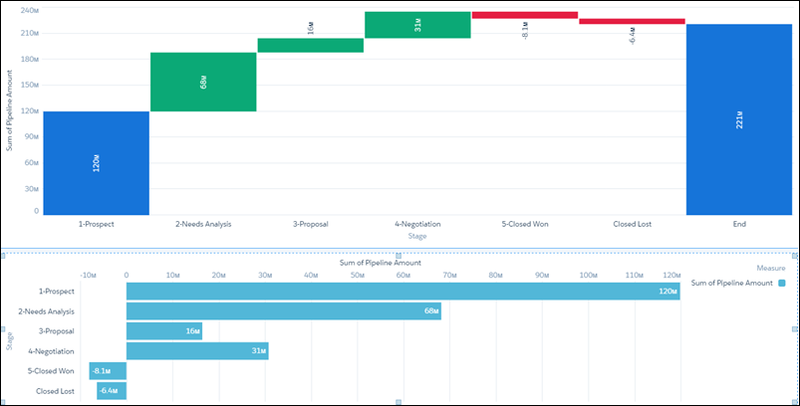 Visually, too, the waterfall chart does a better job of separating out the stages or outcomes, letting you see each stage as it contributes to (or takes away from) total opportunities. The waterfall chart also highlights the relative relationships between the stages in terms of how opportunities flow toward a close. Next, you'll create a waterfall chart out of the dataset you just uploaded to break down the dollar value of pipeline opportunities by stage.